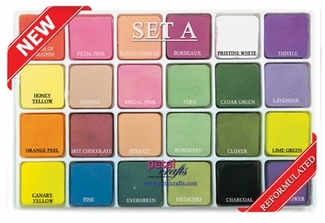 Set of 24 colors. This set of compressed petal dusts give a matte finish when applied to royal icing, fondant and gum paste flowers. This set of compressed petal dust "wafers" provide a wide assortment of colors in one convenient and easy-to-use package. Use in dry form by vigorously rubbing a brush over the wafer and applying to gum paste or fondant. Wet the tip of a brush with lemon extract or clear alcohol (e.g., vodka) and dip into the wafer for painting or highlighting. Refer to product picture for colors.